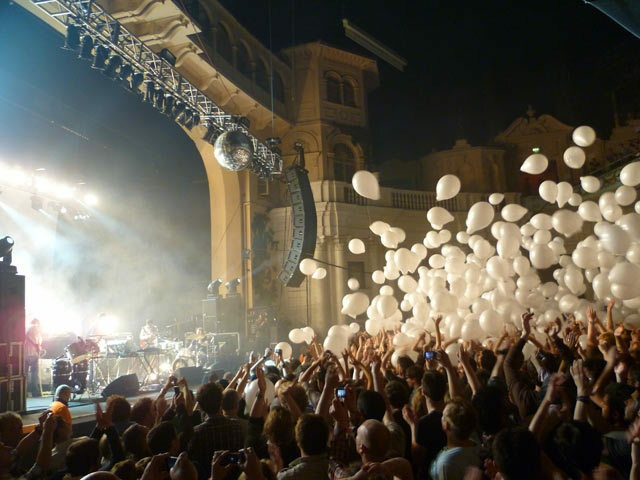 Tickets for LCD Soundsystem's two nights at Brixton may have sold out long ago, but they are still up for grabs for their London Wireless headliner on July 2nd, and based on last night's stunning set, we'd say the £47.50 for the day ticket is looking pretty enticing. Brixton Academy is always a joy - great sound, a sloping floor aiding views for the vertically challenged, and a sense of history that is hard to match. Last night James Murphy and friends added to that history with a performance that lived up to the hype. They rammed their set full of their biggest tunes, but also offered up numerous offerings from their new LP, This is Happening, which was leaked a short while back on the internet and was subsequently streamed for free on their official site. If you like your LCD Soundsystem in equal parts rocking and trippy disco, you will not be disappointed. Funky bass, rousing backing vocals and Rapture-esque cowbells are combined to create an infectious set of tunes that translate well to live performance. The undoubted highlight was All My Friends. LCD Soundsystem fans are a nice bunch and at the risk of sounding too gushing, Brixton last night felt like one big group of friends.